Crystal City has moved beyond the Gold Cup by establishing a Diamond Derby. 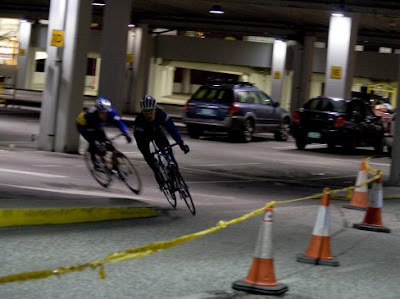 Instead of horses and grass, the Diamond Derby will feature cyclists racing around an underground urban cycling arena. Socializing, spectating, and drinking will be less pastoral-artistocratic and more urban-edgy. This will be a metropolitan event for seeing and being seen. The Dandies & Quaintrelles, who sponsor the legendary Seersucker Social and the Tweed Ride, are leading a fashion-oriented bicycle ride that will conclude at the Diamond Derby. The look for this nine-mile ride is "urban-functional, contemporary and edgy." The smart-money bets for a winner in this ride are on a rider like Squadra Coppi's former bike racer and current fashionista Dana Matassa. Expect to see some intense bike racing action in the underground Crystal City urban arena. Events include an open cyclocross-hashing event, a cycle relay team tournament, and straight-up racing on what is sure to be a highly technical Gran Premio course. Given their outstanding performances in this past fall's cyclocross season, riders such as Squadra Coppi's Kimani Nielsen, Brad Evans, and the one-two intergenerational punch of Jake and Scott Thompson will surely be major threats if they enter. Squadra Coppi's Jason Hall had an excellent road season and is a fearsome sprinter, but may be too big for the course. Squadra Coppi's Joaquin Salas-Orono and Mark Skubis could score well on style points. Coppi's Jordan Cross is probably too genteel for the race, while James Hibbs seems to be focused on winning long races out in the countryside. Make your own bets, and be ready for some surprises! The Crystal City Diamond Derby will occur on Saturday, March 10, from 2pm to midnight at 1851 South Bell St., Crystal City, VA. The event is free and open to the public for spectating, fashion riding with the Dandies & Quaintrelles, casual riding in the arena, and socializing in the late evening Diamond Derby Ball. The competitive cycling events require registration and an entry fee. Here's the complete event schedule. Don't miss the Diamond Derby! Photo: Squadra Coppi's Brad Evans racing in a Reykjavik parking lot. Courtesy of Brad Evans.